was born on 16. February 1895 in Konstanz. His jurisprudential graduation and habilitation took place at the University of Freiburg (Breisgau). He was appointed to his first professorship at the University of Jena. In 1940 his teaching permission was revoked because of his criticism on the Nationalsocialist’s policy against Jewish fellow citizen. Not until 1945 he was appointed again to a professorship, at first at the University of Freiburg and in 1946 at the University of Frankfurt. Franz Böhm always aimed to get his academic insights political effective. He worked out a concept of an antitrust code for the resistance movement around Carl-Friedrich Goerdeler and he was significantly involved into the preparation of the 1957 signed law against restraints on competition. 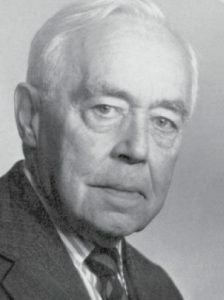 In the post-war years he was Minister in the government of Hessen, chief navigator for the negotiation of the treaty of compensation with Israel and between 1953 and 1965 member of the German Parliament. From 1948 on he was also member of the academic advisory board at the Federal Ministry of Economics. He died on 26. September 1977. Franz Böhm called competition ‘the most ingenious instrument of disempowerment’ (‘genialste Entmachtungsinstrument’). He pointed out the necessity to defend the economic order of competition against danger from private forces and trusts as well as the necessity to protect the market-based order of civil law as an order of legally equals against dangers emerging out of the acting of interest groups, which try to get privileges by influencing on the political process. For further information: ‘Der Ökonom Franz Böhm gilt als Vater des deutschen Kartellrechts’, in: Die Wirtschaftswoche, June 2006.